Your Canon EOS Digital Rebel gives you the best of both worlds: You can use all the photography techniques of a manual camera, or you can take advantage of a digital camera’s advanced functions. You access many of your digital camera’s features via internal menus, and we guide you through the Canon EOS Rebel’s menus here. The Canon EOS Digital Rebel XSi/450D menus, conveniently enough, appear when you press the Menu button. Features are grouped into six main menus, described briefly in the following table. Open This Menu . . . Shooting Menu 1 Picture Quality settings, Red-Eye Reduction flash mode, and a few other basic camera settings. 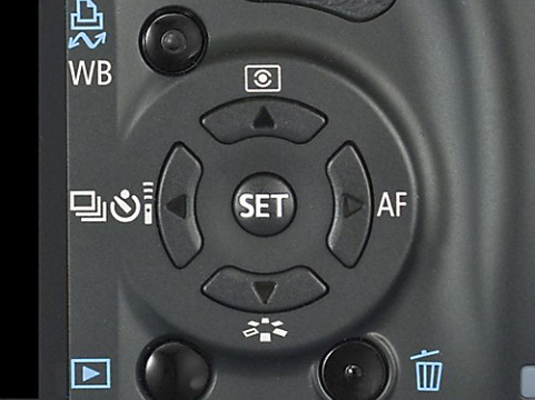 Shooting Menu 2 Advanced photography options such as flash exposure compensation and automatic exposure bracketing. Menu appears only when you use advanced exposure modes (P, Tv, Av, M, and A-DEP). Playback Viewing, deleting, and marking pictures for printing. Setup Menu 1 Basic camera-customization options, such as the file-numbering system. Setup Menu 2 More customization options, Live View control, and maintenance functions, such as sensor cleaning. Some options available only in advanced exposure modes. Setup Menu 3 Custom Functions and a couple other options; menu appears only in advanced exposure modes. My Menu User-customized menu setup; also available only in advanced exposure modes. The Set button and cross keys, shown below, are the key to the navigating menus. You press the cross keys to navigate up, down, left, and right through the menus. Press Set to access available settings. After you press the Menu button, you see on the camera monitor a screen similar to the one shown below on the left. At the top of the screen, you see a series of icons, each representing one of the seven menus. The highlighted icon marks the active menu; options on that menu automatically appear on the main part of the screen. In the figure on the left, Shooting Menu 1 is active, for example. To select a different menu: Press the right or left cross keys or rotate the Main dial to cycle through the available menus. To select and adjust a function on the current menu: Press the up or down cross key to highlight the feature you want to adjust. Next, press the Set button. Settings available for the selected item then appear either right next to the menu item or on a separate screen, as shown in the figure on the right. Either way, use the cross keys to highlight your preferred setting and then press Set again to lock in your choice.